Today's mission is to declutter your car's interior, removing trash and anything that does not belong there. 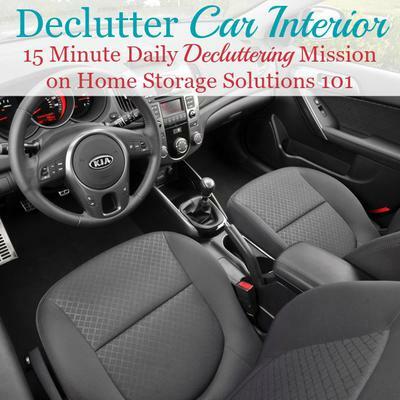 This mission is designed to be done while you're working on the Car Organization Challenge, which is part of the 52 Week Organized Home Challenge here on the site. The steps for this mission are pretty straightforward. First, remove and throw away all trash from your vehicle's interior. Don't forget the floors and the backseat where the kids sit, and all the little pockets on the sides of doors or on the back of seats. (We've got other days missions to do the trunk and glove compartment so you can wait on those areas). Second, remove all the "stuff" you've got in your car's interior. If you're like me many of these items actually don't belong in your car permanently, but instead need to be put back away, inside, where they actually belong. Here's a photo, to the left, from a reader, Daphne, who showed me all the stuff that she'd accumulated inside her car. 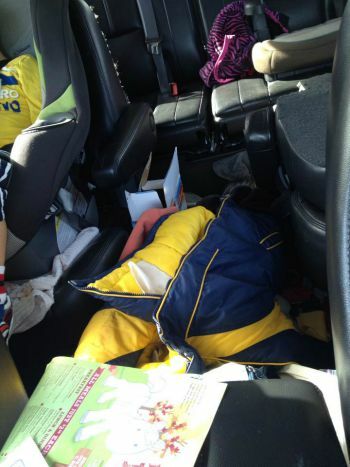 She said: "With four kids we always have piles of stuff in the car!" I can completely relate. Kids add a whole new level to car clutter, I've found. In Daphne's photo I see coats and backpacks and all kinds of other stuff. Now's the time to take all that out and deal with it. If you've got extra time, while the interior is cleared out you can give the seats and floor a quick vacuum to get out all the debris that seems to accumulate over time, but that's not necessary. Once you've put everything back inside your home that had been in your car, but that you know didn't belong in the vehicle, seriously evaluate all that you've got left and decide if it has "earned" a spot back into your vehicle. There are very few items that I suggest you definitely have in your car's interior, because mainly you want to have lots of room for passengers to sit comfortably. They need both room to sit, and leg room as well. The one item I do suggest you keep in your car's interior is some type of car trash can, to collect the trash that inevitably accumulates while you and your passengers are in the vehicle. We'll discuss this more below, after you see a photo from a reader who has already taken this challenge to get you inspired. So are you ready to declutter? Here's some photos to inspire you. 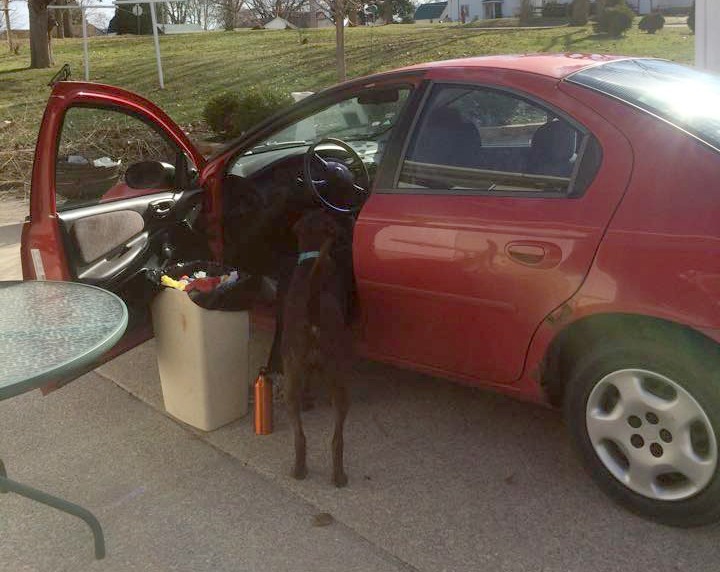 The first is from a reader, Linda, who said, "It's nice weather, so my son is decluttering out the inside of the car he drives!!!!! Not sure I'm impressed he filled up an entire trash bag!" Are you getting excited to tackle this mission for yourself? I hope so. Many readers have already done it and have had great results. 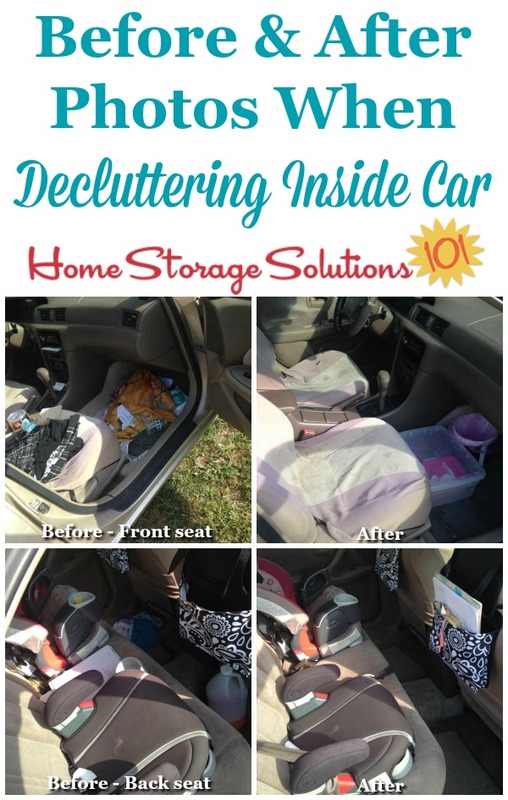 One reader, Michelle, sent in this collage photo of her decluttered car interior, for both the front and the back seats of her vehicle. Great job Michelle! It looks awesome! 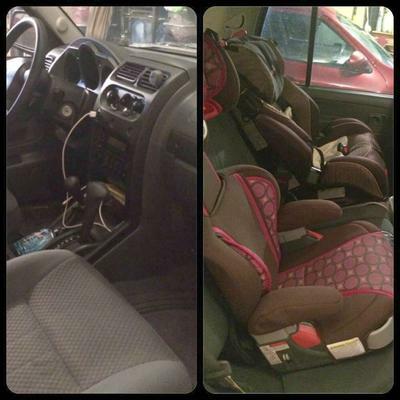 In addition, another reader, Brandy, also sent in several photos showing how she decluttered both her front and back seats. She said, "This definitely needed help. I'm gonna try to stay on top of this. I have added an actual trash can because a plastic bag just wasn't cutting it." Once you've done this declutter mission you most likely know you never want to have to do it again, at least to that extreme. 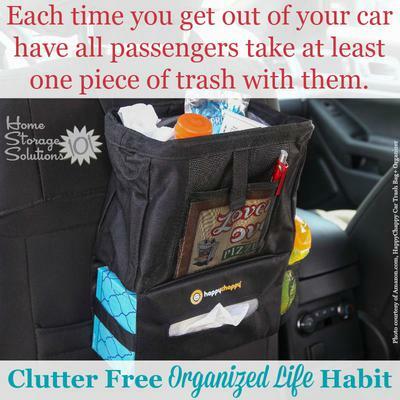 And beside, if you only cleared the clutter out of your vehicle once a year, like it lists in the Declutter 365 calendar, the majority of the time you'd be driving around in a cluttered overly full vehicle. Not good. 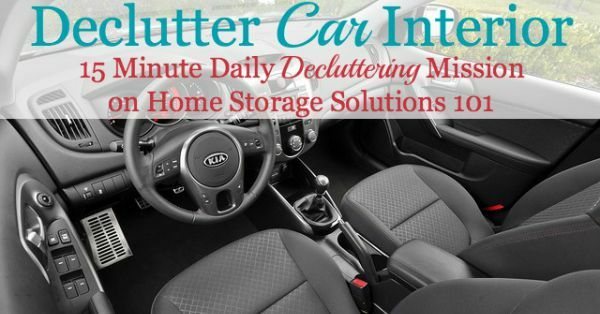 So again, just like several other of the missions we've done, this is one where today is the day to start a new habit, that will help you keep your car clutter free from now on. And fortunately it is a simple habit to start and continue. All you've got to do is each time you and your passengers get out of the car you have them bring with them their stuff that they carried into the car, and a piece or more of trash. I know we're all busy when we get out of the car, with our hands full and often we're already focused on the next activity, since the driving is done. BUT, once I made this a habit, and took those couple of seconds to pick up my trash and have others do the same, the car became a much more pleasant place to be in, and without a lot of effort. Sometimes it really is the simple things! The photo above shows a car trash can in action. And as I mentioned it is one of the few things I definitely think you need to keep in your car's interior because they are a great way to actually have everyone collect the trash and throw it away eventually, instead of it just accumulating in the car. It doesn't have to be a fancy one, although there are many available on Amazon, but it can just be a plastic grocery bag that once it's full you dump in the trash, bag and all. Have you done this mission yet? When you do I'd love to see your results. You can send in your photos here to show me what you've accomplished. The best ones will be featured here on the site! I hope seeing these pictures and these instructions have inspired you to clear the clutter and trash from your car. 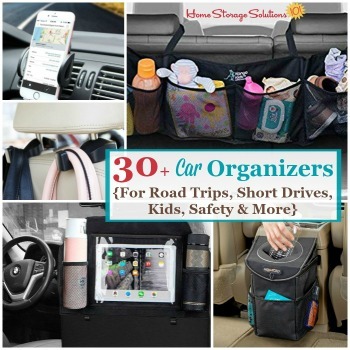 I've created a round up list of over 30 car organizers in my Amazon store (referral link) that you can check out, if this article has inspired you to get your car organized. To find the list go to my Amazon store (at the link), and then scroll down for that list. Thank you so much for the work you did and for your website. I felt completely hopeless. Now I have a plan for 15 minutes. I can do 90 hours if I stick to 15 minutes at a time. Your help makes life better for all who practice your guidance. An idea is to have an addy that folks can send in money if they choose. Thank you again and again and again and again. Let's hope it never happens in the first place, but with a crash, all that clutter become UFO's in your car. Some stuff is harmless when you get hit by it, but some stuff can actually hurt you and your family members! I never thought of that until I took a Scid-course. For me it's a good reason to keep the interior of the car clutter free and put stuff away in the glove compartment. "Everything Out, Every Time." My motto pulling into the driveway for the day, for years. They grumble sometimes, but it honestly makes things so much easier that evening, and the next morning. Over the years, I have developed a 'reputation' for having a washed, clutter free car. This helps me with accountability so that, should things look 'rough' I can quickly turn things around, and I love it when my born organized sister in law says, "You have really got this clean car thing down!" She is as organized as it gets and although I am way behind her, it feels good to be recognized by a 'pro'. I love that the dog is helping!